In addition to hand controls, R&R Mobility has many other products to aid in driving. Spinner knobs come in very handy when using hand controls. Coming in many different varieties, spinner knobs allow a person to turn the wheel with one hand while the other is operating the hand controls. In cases where a driver’s right foot is impaired, a left foot gas pedal may be the solution. 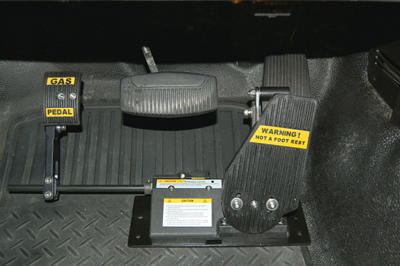 Mounted on the vehicle floor, this removable device allows a person to operate the gas pedal with their left foot. For smaller people that can’t reach the gas and brake pedal we can install pedal extensions. 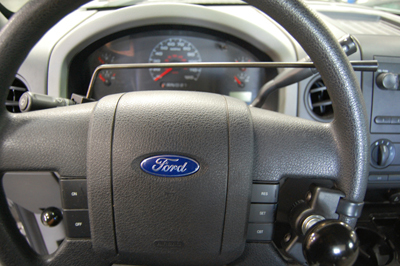 When driving with hand controls, the driver’s left hand is occupied a great deal of the time. Having a blinker extension allows you to operate the blinkers with your right hand. A push button electric shifter allow you to shift your vehicle with the push of a button.